Dogs and babies. Both so cute. Both so funny. But put the two together it can mean disaster, if you are not prepared. Congratulations. You're having a baby! You've prepared the baby's room and purchased everything you'll need. But is your Schnauzer ready for the new addition to the family? If you will be bringing home a new baby soon, now is the time to begin preparing the family dog. Your Mini Schnauzer probably already knows "something is going on" just from the changes in your routine and home furnishings. So to be sure the first encounter between them is successful and goes smoothly, here are 20 tips outlined in what otherwise is really just a two-step process. Step 2) Introduce the two of them slowly at your Schnauzer’s pace. Preparing your dog for your new baby in advance is one of the best ways to help avoid friction and jealousy between them. Remember, your Mini Schnauzer is used to your full attention and pampering, so some jealousy is to be expected. 1. Take your dog to the vet a few months ahead of time for a complete checkup. This is a good precautionary measure to take since worms and other parasites could be harmful to your baby. This would also be a good time to have your dog spayed or neutered if you haven't done so already. Not only will you be helping the ever growing pet population but studies have shown that sterilized pets typically have fewer health problems and are also calmer in nature... ie less likely to be aggressive towards the baby. 2. Ask friends with small infants to come over for a visit. By having friends stop by with their babies will help accustom your Schnauzer to being being around babies. Just be sure to supervise all dog and baby interactions. 3. Allow your dog to explore the baby’s room and or baby-related items. Let your Schnauzer take a good sniff of the baby’s crib, toys, diapers, and all other new baby items so that he is familiar with all the new smells. Bonus tip: Begin rubbing baby lotion on your arms daily so your Schnauzer gets accustomed to its smell. Since canines rely heavily on their sense of smell, your Schnauzer will recognize this smell on your baby and accept the baby as a part of the family. 4. Familiarize your dog to the new noises that will be in your home a couple of months in advance of the baby's arrival. If possible record the sounds of a baby crying for your Schnauzer to hear. Turn on the baby’s mechanical swing or any toys you may have already purchased for the baby that make noise. Exposing your Schnauzer to the many different baby-related noises and creating a positive association with each of them can really help reduce your dog's anxiety and sensitivity to these new sounds once you bring the baby home. A word of caution: While you want your Schnauzer to become familiar with all the baby items, do not let your dog sleep on baby blankets or play with baby toys. Baby items should only be introduced for familiar sounds and smells only. 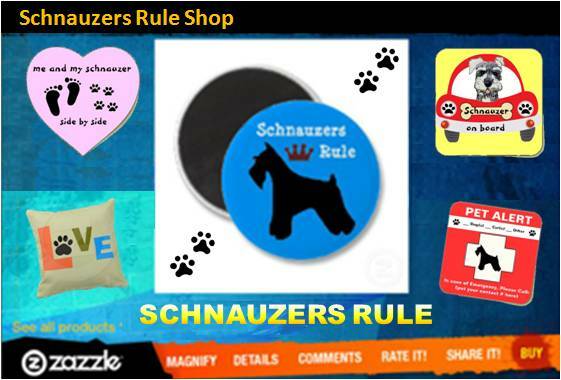 Your Schnauzer should know that these items are off-limits. 5. Don't isolate you dog completely. If the baby's room will be completely off-limits to your Schnauzer, instead of shutting him out entirely, install a sturdy barrier or removable gate to achieve the same thing. This way your dog can still "see and hear" what's happening in the baby's room without actually being in there. This will help avoid feelings of isolation from the family which could be viewed as punishment due to the baby. 6. When you walk your dog take the baby stroller with you. Help your dog get accustomed to the baby stroller by making it a part of his daily walks. You can even put a baby doll in the stroller if you like. But the whole idea is to get your Schnauzer used to walking beside a stroller and easily accept taking the baby out along with you on walks later on. 7. Basic obedience commands are important for your dog to know. If you haven’t yet, teach your dog all the basic obedience commands: come, sit, stay, down, heel. 8. Get your dog further training if needed. If your Schnauzer has any existing behavioral problems, now would be the time to get some help from an animal behaviorist. So if your dog nibbles on you during play, jumps up or pounces, constantly barks, ..... or whatever the problem is, deal with it now. 9. Keep your Schnauzer well-groomed. You will want to keep your Miniature Schnauzer clean and clipped. And it will be especially important to keep his nails trimmed. 10. New household rules should be taught to your dog in advance. Make any new household rules a good 2 months in advance so your dog is accustomed to the changes. In other words, if you plan on changing any "acceptable rules" into "no longer acceptable rules" do so now. Example of Rule Change: It used to be okay for your Schnauzer to sleep in your room but after the baby is born, you plan on having your dog sleep somewhere else. If this is the case, go ahead and make that type of change early-on so your Schnauzer doesn’t associate any of the changes with the arrival of your new baby, which could in turn, intensify jealousy. One final tip: Make arrangements now to have someone come and care for your dog during baby delivery time. Ask someone you trust and that your Miniature Schnauzer likes to take him for walks, play with him and feed him, so he is not left alone for what could turn out to be a very long time. The actual introduction of your Miniature Schnauzer to your newborn is of utmost importance. The first few meetings often dictate how your Schnauzer will respond to your baby on an ongoing basis. For this reason, it is crucial to undertake the introduction process slowly. 1. Bringing home baby. When you come home with your baby, have someone other than yourself (Mommy) actually bring the baby inside your house. Your dog has missed you terribly and it is important that you pay attention to your Schnauzer and greet him when you first get home. Only after your Schnauzer has calmed down from the excitement of your return should you try to introduce your dog to your baby. 2. Err of the side of caution. If you are unsure of how your Miniature Schnauzer will react to the baby, have someone control him on a leash during the introduction. 3. Sniff-Sniff. Encourage your dog to get a good look and sniff your baby’s hands and feet, but do not force a reluctant dog by pushing the infant in front of your dog. 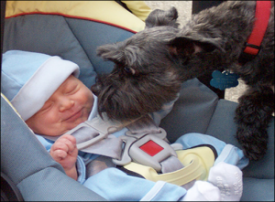 Allow your Schnauzer to explore the new baby smells at his own pace. Never force the situation. 4. Never leave your baby unsupervised with your Schnauzer. And it doesn't matter how well trained your dog is. Just don't do it. The unpredictable actions of a baby (kicking, screaming, crying) could frighten your dog which could cause him to bite. 5. Get even closer. After the initial greeting, allow your Schnauzer to sit next to you while you are holding the baby. Praise your dog for behaving properly and reward him with treats so that he begins to associate the baby with a positive experience. 6. Quality Dog Time. When your baby is napping, use that time to spend quality one-on-one time with your Miniature Schnauzer. Having a newborn is an extremely busy and demanding job but it's important to continue to give your Schnauzer as much love and attention as possible. 7. Maintain a regular routine. Dogs like routine as they are creatures of habit. Try to keep your Schnauzer's routine as normal as possible so he can adjust. 8. Company is coming. When visitors come to see the new baby tell them in advance to acknowledge your Schnauzer first as they always did before when coming over for a visit. 9. All family members need to participate. Everyone in your family should help now more than ever to ensure your Miniature Schnauzer continues to receive the positive attention he always got. He still needs his daily walks, play time, brushing, belly rubs, etc. 10. And they lived happily ever after. With proper training, supervision, and some adjustments, you, your new baby, your Schnauzer and the rest of your household should be able to live together safely and as one big happy family. By following these 20 tips on dogs and babies, you can ease your Schnauzer's stress and help him welcome home your new baby. This way your family stays intact. And by getting the two of them off on the right foot they will bond and form a very special relationship of their own. Get Even More Advice: Consult with your veterinarian and your pediatrician to get further expert tips on dogs and babies. Have your dog neutered. If you haven't already done so, neutering your dog may help reduce territory marking - but it does not completely eliminate it. Benefits of neutering your dog from the ASPCA. Your dog is marking ownership over his territory. Make sure you allow your dog to spend supervised time with the baby. He needs time to bond with the baby. He will soon realize the baby is not invading his territory but part of his "pack". Have your dog wear belly bands while inside the house to prevent the marking. "Knowledge Share"... If you found this page on Dogs and Babies helpful and informative, please share it with your dog-loving friends by clicking on one of the share links (like facebook, twitter, and google +1) located at the top right or bottom of this page. Share With Us How Your Dog Reacted When You Brought Home Your New Baby.